In existence from the 2nd c. B.C. 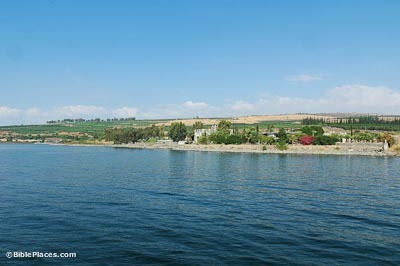 to the 7th c. A.D., Capernaum was built along the edge of the Sea of Galilee and had up to 1500 residents. Today the ruins are owned by two churches: the Franciscans control the western portion with the synagogue and the Greek Orthodox’s property is marked by the white church with red domes. The dating of this synagogue is debated, but it is clearly later than the first century. 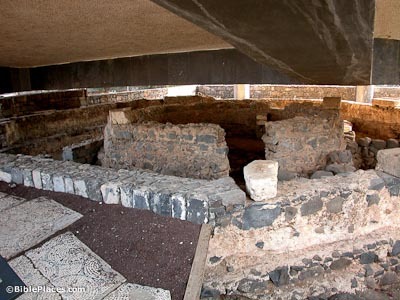 Excavations have revealed a synagogue from the time of Jesus with walls made of worked stone and 4 feet thick. These earlier walls were preserved up to 3 feet high and the entire western wall still exists and was used as the foundation for the later synagogue. Jesus was confronted by a demoniac while teaching here (Mark 1:21-27). In Capernaum, Jesus healed the servant of the centurion. This Roman official was credited with building the synagogue (Luke 7:3). In this synagogue, Jesus gave sermon on the bread of life (John 6:35-59). Excavations revealed one residence that stood out from the others. This house was the object of early Christian attention with 2nd century graffiti and a 4th century house church built above it. In the 5th century a large octagonal Byzantine church was erected above this, complete with a baptistery. Pilgrims referred to this as the house of the apostle Peter. 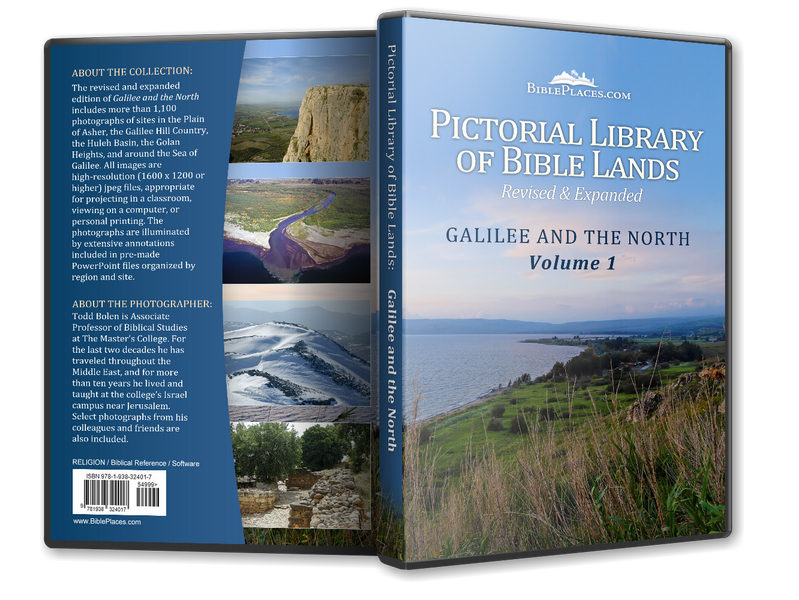 At BiblePlaces.com, see the related sites of Sea of Galilee, Bethsaida, Chorazin, Cove of the Sower, Mt. of Beatitudes, and Tabgha. 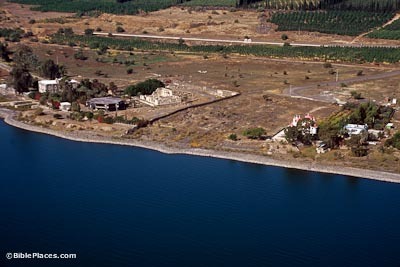 Capharnaum – the town of Jesus (Franciscan Cyberspot) Very extensive site by the Franciscans, featuring an interactive aerial photograph. 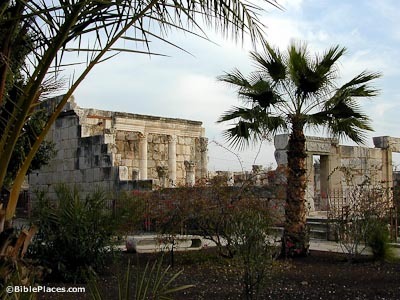 Capernaum (Walking in Their Sandals) Gives easy-to-read information on the location, biblical significance, etc. Features links to photographs and on-line scripture references. Capernaum (Crystalinks) – Limited, but map shows Capernaum’s location. Capernaum (Second Temple Synagogues, by Donald D. Binder) Features good pictures and text, focusing on the synagogue. 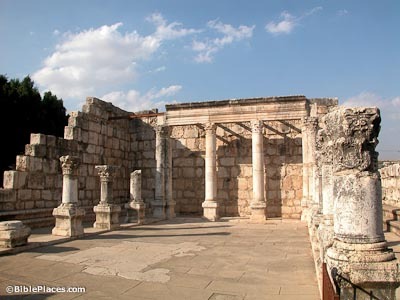 The Synagogue at Capernaum (Jewish Virtual Library) Gives an interesting and detailed history of the synagogue, including links to descriptions of related terms. Capernaum (Christian Travel Study Programs, Ltd.) Limited text, but site features several good pictures with excellent identifying captions. Capernaum (Into His Own) A brief, encyclopedia-type article with multiple links to related words and topics for further study. Ancient synagogues in Bar’am and Capernaum (The Jewish Magazine) Offers an interesting look at early synagogues in general; looks specifically at two Galilean synagogues.